On the second floor, finger food, cakes and beautiful table already waiting for us ^o^! Delicious pretty cake and cookies, nyummy! Here's all of us listening to Mba Ria (left) about today's workshop. The first thing we're going to do is to make herbal tea. Next, we're making our own lip balm (my favourite!) My lip balm ingredient is orange, rose geranium and bergamot. The main ingredient for lip balm is coconut oil and beeswax. All the ingredient mixed and heated, after it's done, we have to wait around 30 minutes until it's cool, then we can try our own lip balm, yeay! 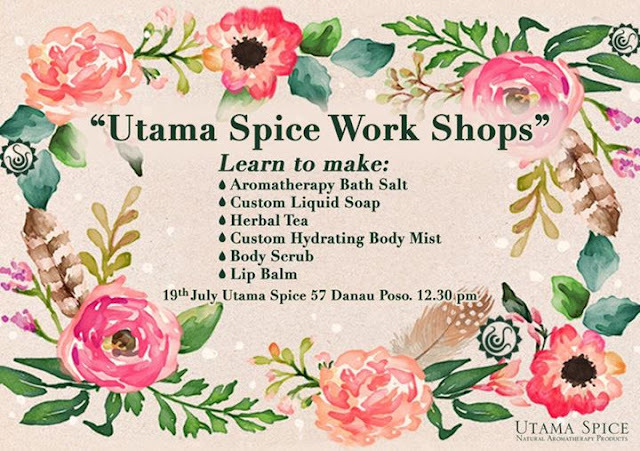 We continue making our own body mist, liquid soap, body scrub and bath salt. It's so easy to make, we just have to mix the base and our custom ingredient. My body mist and liquid soap have similar ingredient which is orange, lemon, tangerine and bergamot. My body scrub contains nutmeg, coriander. kencur, rice, brown rice, temu kunci and temulawak extract. Last but not least, my bath salt contains plain salt, kunyit (turmeric), Telang flower, gambir, orange, tea tree, mint and rosemary. Going to try these lovely product soon!